When we first encountered a description of The Jazz Age on TDF’s website, we immediately purchased tickets with very high expectations that this just had to be one terrific show. Billed as a trilogy of one act plays by F. Scott Fitzgerald, Dorothy Parker and Floyd Dell, with musical numbers by Irving Berlin, Jerome Kern and George Gershwin, the production sounded like a sure winner. And so it was with heightened expectations that we entered the Royal Theater at The Producers Club yesterday to attend one of only a half dozen performances of this small off off Broadway show presented by Love Creek Productions and The Dialectix Group and conceived and directed by Aaron Sparks. Alas, we were to be sorely disappointed. The Jazz Age was a time of gaiety, exuberance and excess, but you’d never know it from this production. The theatre itself is small and dark, and the dreary sets and minimal costuming did nothing to offset that. The plays themselves were slight; the songs were B-list selections at best; and the singing, acting and direction were very uneven. The net result was a generally leaden production. The first of the three one act plays, Porcelain and Pink by Fitzgerald, was less a play than a fleeting idea for one or, to be generous, little more than a scene from a play rather than a full act. The entire play takes place with Julie (Kristin Carter) in a bathtub, first in conversation with her sister and then with her sister’s beau (he, discreetly placed on the other side of the bathroom door). Ms Carter plays her part with a delightful impetuosity but the play itself is so trivial and the set so dull, that even her charming performance can’t save it. 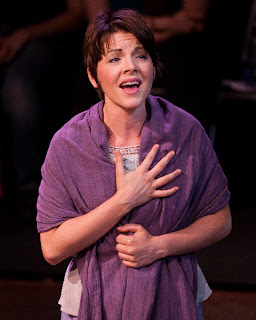 Kristin Carter as Julie in Porcelain and Pink. Photo by Steven Barrett. In a Director’s Note in The Jazz Age program, Mr. Sparks remarks that, prior to his having embarked on this project, he had been unaware that Fitzgerald had written any plays. We were similarly unaware but now we can understand why we did not know of his plays before this. It’s not that Fitzgerald’s plays simply were forgotten gems; rather it’s that they are eminently forgettable. (This only assumes, of course, that Porcelain and Pink was at least as good as Fitzgerald’s other theatrical work. But this is a fair assumption, I think, since Mr. Sparks did claim to have been even more enamored of this play than he was of any of Fitzgerald’s other plays. The second of the three one act plays, Here We Are by Dorothy Parker, was the best of the bunch. Parker’s sardonic wit shone through this dated take on a newly married couple’s anxieties in anticipation of their consummating their marriage later that night. Karen Zondag as “She,” the new bride, was the standout in this one but, again, neither the play itself, nor the costumes, nor the set, were especially memorable. The third play in the trilogy was Sweet-and-Twenty by Floyd Dell, one of Edna St. Vincent Millay’s many lovers (and a minor literary light in his own right.) The play treads familiar ground (boy and girl meet and fall in love, believing that they are being independently impulsive in doing so, but without realizing that their respective aunt and uncle were desirous of their getting together in the first place), and exploits a variety of stage cliches without really breaking any new ground. Before the plays begin, in between the plays themselves, and after the final one act play ends, we are inundated with a number of songs from the Jazz Age, performed by the actors themselves. These include “Ain’t We Got Fun,” “All by Myself,” “The Sheik of Araby,” “Everybody Step,” and “Look for the Silver Lining” but the most enjoyable renditions are “Ballin’ the Jack” and “Stairway to Paradise,” both performed by Kristin Carter (who provided the small spark in Porcelain and Pink as well). When I took my granddaughter Naomi (aged 10 1/2) to see Alice: A New Musical, I felt a bit as if we were about to descend into our own rabbit hole. We were eagerly anticipating what we were about to see, we were more than willing to suspend our disbelief, and yet we were fearful that we might be disappointed by a limited off off Broadway interpretation of the book by Lewis Carroll that we both knew and loved so well. In my experience, off off Broadway plays, particularly adaptations of classics, are notoriously uneven: a few are delightfully creative productions but all too many others turn out to be pale imitations of the original works upon which they are based. But in this case, I must say that we really lucked out and we emerged from our descent into the rabbit hole with broad smiles on our faces that would have done the Cheshire Cat himself proud. To be sure, Andrew Barbato and Lesley DeSantis (co-writers of the book, music and lyrics), in squeezing Carroll’s opus into a one hour stage production, did omit many of Carroll’s best scenes and I must admit that if I’d had my druthers, I’d have preferred to have seen the play expanded to, say, two hours, with even more of Carroll’s original work preserved. But given the time constraint, what remained was relatively true to Carroll’s book with Alice (Rocio Del Mar Valles) and her sister (Ashley Dawn Mortensen), the Queen of Hearts (Rachel Bahler) and the White Queen (Lizzie Klemperer), the Mad Hatter (David R. Gordon) and the White Rabbit (Cameron Perry), Tweedle Dum (Joe Chisholm) and Tweedle Dee (Devon Stone), and all the rest of this very talented cast all dutifully appearing on schedule to entertain an entranced audience. The music, book, lyrics and costumes were all enjoyable and the entire company’s singing was truly exceptional. The set was close to as minimalist as you can get but Andrew Barbato (who not only co-wrote and directed the play but was its set designer as well) was more than up to the challenge: he set a tall ladder on its side, added a box, a wheel and a scrap of cloth and –voila! – there was the ship adrift on Alice’s sea of tears. He angled the ladder a bit differently and dispensed with the box, the wheel and the cloth – and there was the entrance to the rabbit hole. He stood the ladder upright and as Alice ascended and descended, the audience shared her magical shrinkage and enlargement. The play’s producers did take one small liberty with Carroll’s book and that was all to the good: it was to portray Alice as a thirteen year old girl who runs away from home and embarks on her adventure on the very day scheduled for the birthday party her mother has planned for her, lest she be forced to grow up too fast and abandon her youthful imagination. By portraying her in that manner, the play’s producers managed to deliver a couple of worthwhile messages to their audience (as well as an hour’s entertainment): to wit, that becoming an adult doesn’t have to mean totally relinquishing one’s childhood; that one’s own mother is seldom as bad as her daughter might make her out to be; that mothers, too, have problems of their own; and that, when all is said and done, not only mothers but siblings too (even big sisters!) are still worth having around. The City College of New York’s (CCNY’s) New Haarlem Arts Theatre (NHAT) is off to an auspicious start. The brainchild of Eugene Nesmith, Chairman of CCNY’s Theatre Department and NHAT’s founder and Artistic Director, NHAT launched its first production, Blues for Mister Charlie, this month. We saw the play’s final performance today and were greatly impressed. Written by James Baldwin, Blues for Mister Charlie was first produced on Broadway in 1964 and this ambitious NHAT revival, directed by Nesmith, is one of the few major productions of the play staged since then. It is based loosely on the historic real life case of Emmett Till, a 14 year old black youth who was murdered in Mississippi in 1955 and whose white racist murderers, although known, were freed by an all white jury. In Baldwin’s play, the black murder victim, Richard Henry (Reginald L. Wilson) is the son of a pastor, Meridian Henry (Earl Griffin). His murderer, a bigoted white shop owner, Lyle Britten (Stephen Macari), is similarly acquitted of his heinous crime by an all white jury. Baldwin did a brilliant job in the creation of his characters, Richard apparently being something of a composite of Emmett Till and Malcolm X, while his father, Meridian, seemed an amalgam of Martin Luther King, Jr. and other non-violent civil rights leaders. But while Baldwin deserves the bulk of the credit for having created these characters, both Nesmith and the actors portraying these characters are also deserving of accolades for bringing them to life in this production. The cast of about 20 was equally divided between professional actors and CCNY theatre students and the entire ensemble did so good a job that it was nearly impossible to discern without reading the program who were the professionals and who the students. A few in the cast were so outstanding, however, that they deserve to be singled out for special praise. In addition to Wilson, Griffin and Macari, mentioned above, they would include Franceli Chapman as Juanita Harmon, Kevin Hale as Papa D, Johnnie Mae as Mother Henry and, as the actor who came closest to stealing the show, Dennis Jordan in the role of the conflicted white Southern liberal, Parnell James. It has long been considered a breach of etiquette on the part of theatre critics to review plays before they officially open (say, while they are still in previews). The rationale behind that is clear: while a play is in previews, it is assumed that improvements to the production might still be made prior to opening night so that it would be unfair to the play’s producers (as well as its cast, director and anyone else involved in its production), and misleading to potential theatre-goers as well, to criticize the play for shortcomings that might well be overcome by the time the play officially opens. Reviewers occasionally have deviated from that policy, usually when it appeared that a play was being kept in previews and its opening delayed, simply because its producer had reason to believe that once the play opened, it was likely to be panned by reviewers and that the producers might be better off selling tickets to risk-taking theatre-goers willing to purchase tickets to un-reviewed “preview” performances before the news got out as to just how bad the play really was. Just such an exception was made by several reviewers who elected to review (and pan) Spider-Man: Turn Off the Dark before that play officially opened (at which time it was generally re-reviewed and panned again). But those were exceptions. The general rule, relatively consistently subscribed to by most reviewers, was not to review a play until it officially opened. Bearing that in mind, I have generally refrained from reviewing any production myself until it officially opened. 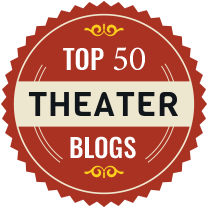 Indeed, I have been reviewing plays on this blog for more than a year now (I’ve reviewed more than 75 separate productions overall) and, until last week, I always withheld my reviews until after the plays I’d seen officially had opened. Recently, however, I’ve come to re-think that policy and I’ve come to the conclusion that, at least for me on my blog, it is outdated and actually does a disservice to the theatre-going public. So last week I reviewed Death Takes a Holiday while it was still in previews and I’m likely to review other plays while they are still in previews in the future as well (although I imagine that I’ll continue to publish the bulk of my reviews post-opening, if only because I’m likely to see more plays after they open than before). First, it used to be the case that preview performances of a play were priced at a discount to performances after a play officially had opened. That made sense. Producers were providing a quid pro quo to those theatre-goers willing to view unpolished productions. But today, most tickets to most shows cost as much for preview performances as for post-opening performances and it strikes me that if tickets to preview performances are worth as much as tickets to post-opening performances, then those preview performances also should be deemed worthy of being reviewed. Second, it is the case that, even now, many theatre reviews appearing after a show has opened are based on what a reviewer actually saw at a preview “press performance” in the days before the show officially opened anyway. And if it’s OK to base a review that will appear post-opening on a pre-opening performance, why not publish that review pre-opening as well? Third, pre-opening reviews by the general public already are widely available on the internet right now. On the New York Times theatre website, for example, one can read eight different readers’ reviews of Death Takes a Holiday today, although the Times itself has so far refrained from reviewing the show since it won’t officially open until July 21. Similarly, one can read seven different readers’ reviews of that show on broadwaybox.com. But if it’s acceptable for readers to post reviews on those sites pre-opening, why shouldn’t it be equally acceptable for critics to do likewise? Fourth, some plays, particularly off off Broadway productions, have such short runs (including previews) that if a critic were to wait until they officially opened to review them, his review might not be published until those plays’ overall runs were nearly half over. And that could severely limit the amount of time available to those theatre-goers awaiting his review before determining whether or not to see the shows in question. Finally, I believe that theatre-goers who are considering purchasing tickets to a play before it has opened will, in fact, be best served if they are able to read critical reviews of the play before they actually buy their tickets – whether the tickets they ultimately buy are for previews or for post-opening performances. And I’d like to help them out there. But transparency and full disclosure on the reviewer’s part are absolutely essential. If he is reviewing a show before it opens, or even after it opens but based on a performance he saw in previews, it is absolutely incumbent upon him that he make that clear to his readers. And that’s just what I intend to do. Having seen two disappointing Off Broadway musicals on Saturday and Sunday (see my last two posts on The Magdalene and Death Takes a Holiday), we opted to do something other than attend the theatre yesterday. It was the last day of the three day Fourth of July weekend and we thought it would be fun to stroll down the recently opened extension to the High Line Park from West 16th to West 30th Street. We’re glad we did. We walked the initial stretch of the High Line some months ago and enjoyed it then, but I found myself enjoying yesterday’s stroll along the newly opened extension even more. Maybe it’s because the flowers were in bloom. Maybe the 16th-30th Street extension overlooks a more interesting stretch of the city. Maybe I was just in a better mood. Or maybe it was because it was the Fourth of July holiday which resulted in there being an even larger crowd of the disparate groups that make New York the great metropolis it is: blacks and whites, Asians and Hispanics, young and old, invalids confined to wheel chairs and toddlers confined to strollers – a really motley crowd of all segments of society to be sure - and I just loved being part of it. By the time we descended from the High Line at 16th Street, it was lunch time and we looked about for someplace to eat. 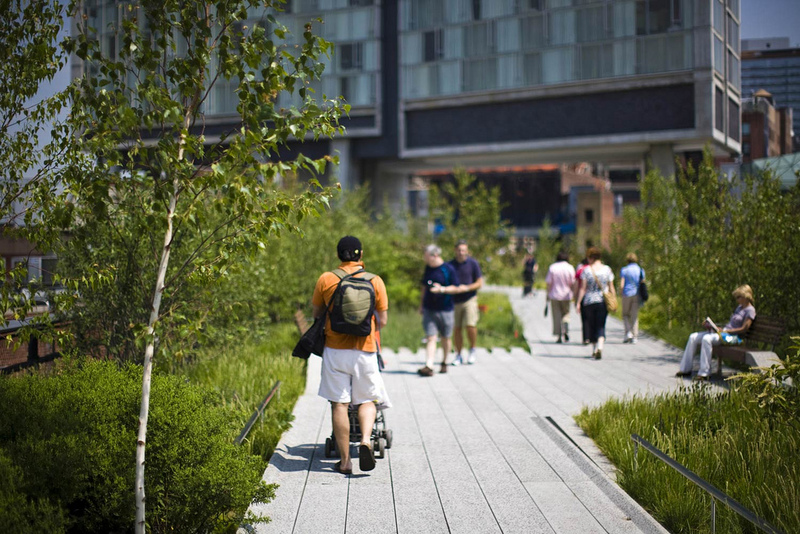 A number of fine restaurants have opened in the area, encouraged by the increased traffic flow attributable to the opening of the second stage of the High Line Park, but that’s not what we were looking for. In keeping with our stroll along the High Line, we just wanted to discover a typical New York diner where we could get a good but inexpensive meal. Luck was with us. There on the corner of 10th Avenue and West 18th Street we found just what we were looking for: The Star on 18 Diner. A typical slightly grungy Greek diner with standard offerings of omelets, salads, burgers, gyros and souvlakis, the diner also offered a variety of special lunches of the day at prices averaging about $10 a meal. I opted for something a bit unusual: a grilled cheese sandwich with mushrooms and bacon on challah bread – and it was delicious. Sue stuck to a more traditional diner offering: a chicken gyro and Greek salad platter – and thoroughly enjoyed it. Both of our meals came with enormous portions of great French fries and included cups of excellent Yankee bean soup and rich rice pudding for dessert. For diner food, it was terrific – and the whole tab, for the two of us – came to less than thirty bucks. A steal. And a great way to end the third day of a Fourth of July weekend in New York. All well and good and the producers are to be commended for including these remarks in the play’s program. But it is scarcely enough and their sanctimonious commentary is not convincing once one sees the play itself. For despite their apparent misgivings and assurances that they “are currently in the process of considering, in consultation with Christian and Jewish experts, various proposed revisions to the book and lyrics and changes to the portrayal of the Jewish characters,” it does not appear to be the case that any such modifications as yet have been made. On its face, this remains an offensively anti-Semitic play and, for that matter (although the producers don’t address this in their “Note”) an overtly anti-Catholic one as well. I am willing to accept the producers’ assurances that that was not their original intention but their avowed commitment to correct the situation rings hollow in my ears in light of the fact that there is no evidence that any real action appears to have been taken. Simply “considering, in consultation with Christian and Jewish experts, various proposed revisions” just doesn’t cut it. Setting aside the issues of anti-Semitism and anti-Catholicism, what is one to make of the play as a theatrical production? (Other than that, Mrs. Lincoln, what did you think of the play?) Sadly, even on that score, there’s not much to commend it. The inspirations for the play were the intriguing Gnostic Gospels of Mary and Thomas, with their suggestions that Mary Magdalene was not the repentant prostitute she had been made out to be in the Biblical Gospels, that she was one of Jesus’ Apostles (indeed, that she was first among them and the one he loved the most), that she was Jesus’ lover and perhaps his wife, and that she bore his child. That would seem to provide lots of raw material for a satisfying play – or novel, for that matter – and, in the hands of a talented writer, it does. Working with much the same original material, Dan Brown produced “The Da Vinci Code,” no work of literary genius to be sure, but a thrilling pot-boiler of a novel that kept the reader on the edge of his seat, nonetheless. Here, however, similar source material inspired nothing more than a somewhat disjointed, occasionally incoherent, and generally soporific musical. I wasn’t perched on the edge of my seat eager to discover what would happen next; rather, I was struggling to keep awake. The book was slow and dull and the song lyrics forgettable. The actors were energetic and did the best they could with the material they were given but were given too little to work with to possibly succeed. And at least one actor – Eugene Barry-Hill as Pontius Pilate – was so badly miscast, that he should have grounds to sue. Barry-Hill is a talented actor in appropriate roles but the role he was given here wasn’t one of them. Death Takes a Holiday, an ambitious Off Broadway musical based on the play by Alberto Casella and rewritten for the American stage by Walter Ferris, is not scheduled to open officially until July 21, but can be seen in previews before then at Roundabout Theatre Company’s Laura Pels Theatre. We attended a matinee preview performance on Saturday and left with mixed feelings. On the one hand, the entire cast performed splendidly and their singing voices were spectacular across the board. But, unfortunately, the play itself is nothing to write home about: the book (by Thomas Meehan and Peter Stone) is choppy and dull while the music and lyrics (by Maury Yeston) are derivative, pedestrian and something of a failed attempt at cobbling together operatic renditions with tunes more typical of Broadway musicals. In sum, it was pretty much a waste of some exceptional acting and vocal talent on a theatrical vehicle not really worthy of their efforts. The plot is relatively simple – or even simplistic. Death (Julian Ovenden), determined to discover what it is about life that makes people want to cling to it and fear him, suspends his activities as “The Grim Reaper” for a while, disguises himself as a handsome Russian prince, and descends on an Italian villa to experience what life is all about for himself for the first time. Rather predictably, he falls in love with Grazia Lamberti (Jill Paice) and she with him, which is a bit complicated by the fact that she had just become engaged to Corrado Montelli (Max Von Essen). The remaining characters in the relatively large cast could have constituted the entire entourage of a French farce: Duke Vittorio Lamberti (Michael Siberry) and Duchess Stephanie Lamberti (Rebecca Luker), Grazia’s parents; Contessa Evangelina Di San Danielli (Linda Balgord), Stephanie’s mother; Dr. Dario Albione (Simon Jones), Evangelina’s doctor and an old friend of the Lamberti family; Alice Lamberti (Mara Davi), Grazia’s American sister-in-law who had been married to her late brother, Roberto; Daisy Fenton (Alexandra Socha), Grazia’s best friend who is in love with Corrado; Major Eric Fenton (Matt Cavenaugh), Daisy’s older brother and an American Army aviator who flew with Roberto; and several members of the household staff including Lorenzo (Jay Jaski), a chauffer/gardener; Sophia (Patricia Noonan), a housemaid; Cora (Joy Hermalyn), a cook; and Fidele (Don Stephenson), a majordomo. As we noted at the outset, the play itself, including the book, music and lyrics, at least in previews, left much to be desired. (One may only hope that those shortcomings may be resolved by opening night although it’s difficult to see how they could be since they go to the very core of the production). But that doesn’t mean that we didn’t end up having a good time anyway. We did. The costumes were lush and lovely to behold and at least a couple of the musical numbers were fun (Mara Davi’s performance in “Shimmy Like They Do in Paree” and the humorous reprise of “Life’s a Joy” by Jay Jaski, Patricia Noonan, Joy Hermalyn and Don Stephenson were both delightful). Additionally, Alexandra Socha’s insouciant performance as Daisy and Don Stephenson’s humorous depiction of Fidele brought smiles to our faces. And , as initially noted, the entire cast’s singing voices really were top-notch. So despite the show’s shortcomings, I’m really not trying to dissuade you from seeing it – even in previews. Just realize that if you do attend the show (at least in preview), you’re unlikely to leave the theatre humming any of its tunes.